A large part of the academic writing process has to do with taking notes, collecting quotes, analysing and evaluating them, coming up with your own interpretation, then developing an outline, and finally writing up the material into a draft. I’ve experimented with various set-ups to tackle this process in the past that involved a lot of different pieces of software (see here and here). However, recently I’ve come up with a simplified workflow that ‘only’ requires three pieces of software: ConnectedText, Freeplane, and Outline 4D (aka StoryView). 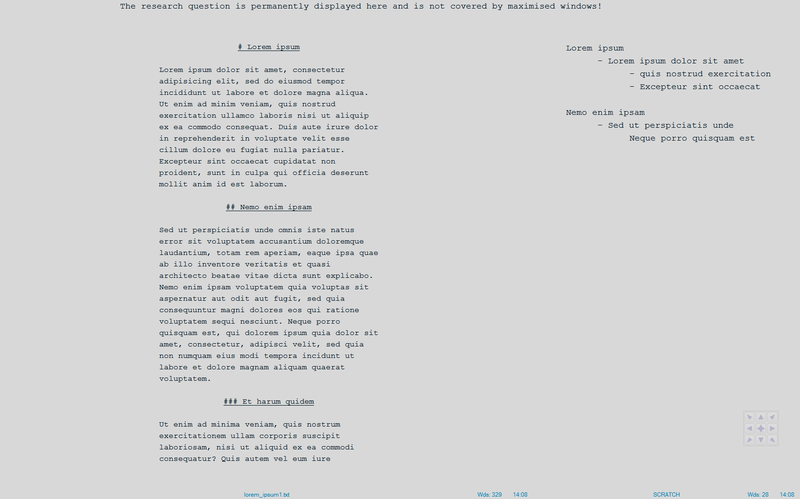 I import quotes and notes into ConnectedText (CT) as I’ve described elsewhere, using my latest reading notes template. As I am reviewing the document, I identify key quotes and notes that I would like to consider as material for the draft. When I come across an important or interesting quote or note, I select the text and type CTRL+ALT+/ to activate Manfred Kuehn‘s “copy to new topic with link” AutoHotkey script (see below), which copies the selected text, creates a new CT topic with it, and also inserts a link under the original text to this new topic. Simultaneously to this process I create an outline for the intended draft using CT’s own Outline tool. Whenever I create a new topic with a quote or note using the process described in point 2, I add a corresponding item to the outline and drag and drop this new topic on it, which creates a hyperlink between the outline item and the selected quote or note. Clicking on the outline item opens the corresponding quote. I export the CT outline as a Freemind (.mm) file and import it into Freeplane (a mind map application). The CT outline has been thus transformed into a mind map. Nodes with links remain clickable, which means that clicking on a particular Freeplane node with a link opens up the corresponding quote or note in CT. 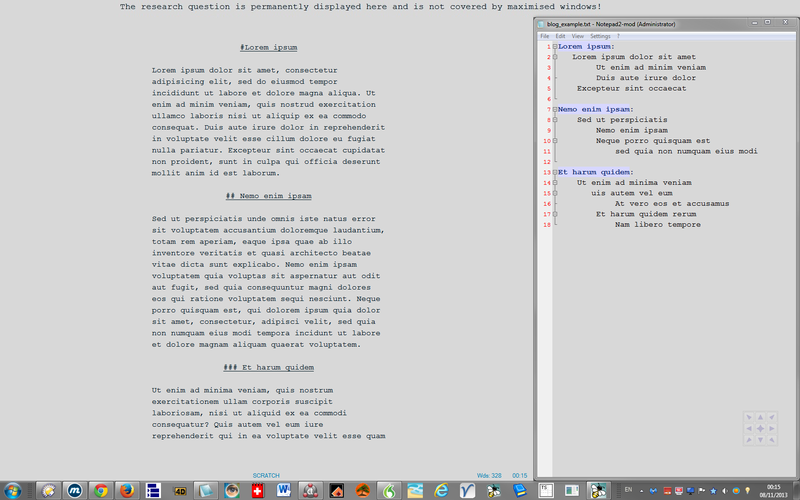 I can add further notes using Freeplane’s own Notes functionality and develop and restructure the outline, if I wish. When I’m finished with outlining and am ready to begin to write the draft, I tile Freeplane and CT vertically in my second (22in) monitor, so I can look at both the mind map (i.e. my outline) and the corresponding quotes and notes in CT. 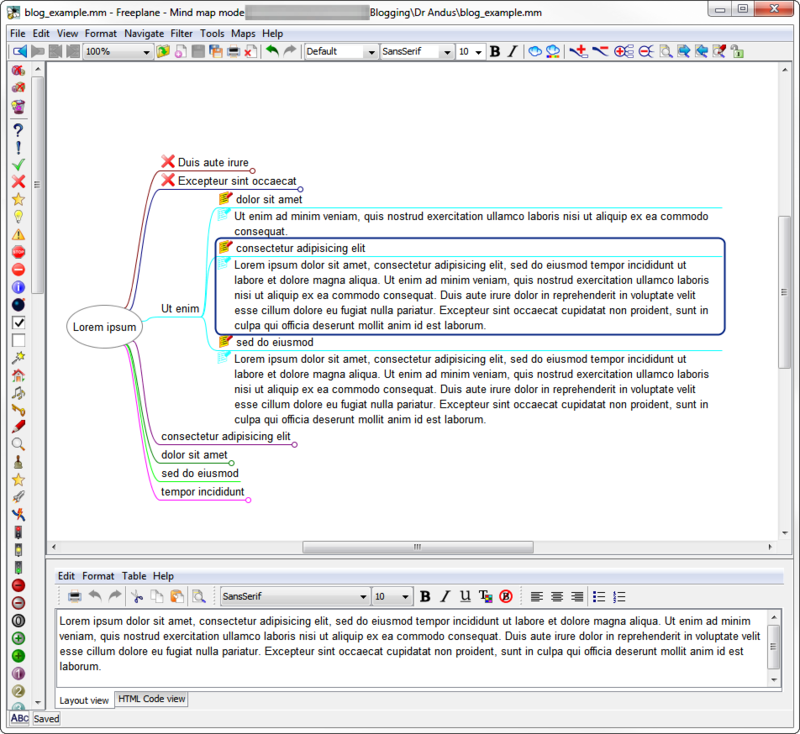 Effectively Freeplane and CT have been integrated to form a funky “dual-pane” outliner, where the first pane is a mind map, and the second pane is the viewer for the note/quote attached to individual mind map items. In my main monitor, I fire up Outline 4D (aka StoryView) and start writing my draft, while also using O4D’s outlining functionalities for almost real-time reverse outlining, i.e. as soon as I write a larger chunk of text, I add headings and sub-headings to it to crystalise the final implicit logical structure (outline) of the emerging draft. All the while I’m following and ticking off the branches of the mind map and copying across selected quotes and notes from the associated CT topics. This workflow could of course be further simplified, as you could simply use CT’s Outline pane and its view pane as the dual-pane outliner in steps 4 and 5, altogether leaving out Freeplane. However, the benefit of using Freeplane is that it gives an airier spacial view of the outline and it also has its own inline note capability, which CT’s Outliner doesn’t have. As for step 6, you could use any old word processor or editor to complete the writing. However, I find that the draft usually develops its own implicit logical structure which won’t be identical to the one in the mind map. To put it differently, there is still abstraction and conceptual development taking place during the writing process and not everything in the mind map will make it into the draft. New ideas may emerge from the draft as well. Hence it’s necessary to engage in reverse outlining to keep track of the emerging logical structure. 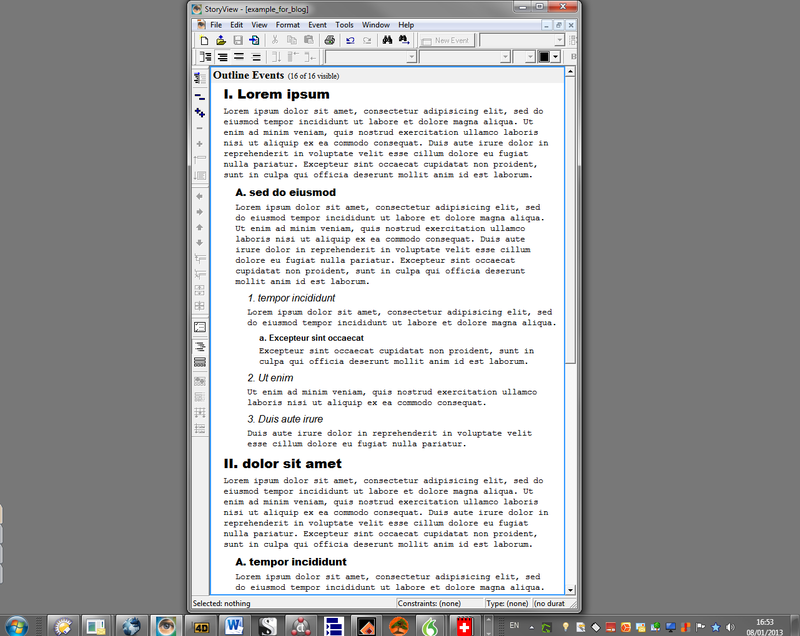 I did try to use MS Word 2010 with its navigation pane for this (by using headings), however I found that Outline 4D as a single-pane outliner with inline note capability was better suited to the task of real-time reverse outlining, thanks to its multiple options to collapse different sections or view only headings or only text or a custom-mix of both. Here is Manfred’s AHK script. If you haven’t used AHK before: 1) download, install and run AutoHotkey_L on your PC; 2) create a new text document in Notepad (or your favourite text editor – I use NoteTab); 3) copy and paste the script below; 4) save the text as e.g. “copy_to_new_topic.ahk” on your desktop; 5) run it by double-clicking its icon; 6) use it by selecting the desired text in CT, typing CTRL+ALT+/ and then naming and saving the new topic. By the way, you could also just use CT’s own built-in “cut to new topic” (CTRL+ALT+N) command, which does not require AutoHotkey and which also leaves a link behind in the original topic. However, I prefer to use this “copy to new topic” AHK script because I want to preserve the integrity of the original document (which e.g. could be the full text of an academic article). Here is a visual representation that summarises my academic writing workflow with the associated tools. It should be read in light of my additional comment below (i.e. there are two different types of outlines and sets of evidence represented). I have also included the tools that I use for note-taking (step 1).